Commentary: This is one of a small group of spectacular imperial yellow glass snuff bottles that we can confidently attribute to the imperial glassworks, and probably to the first half of the Qianlong period. 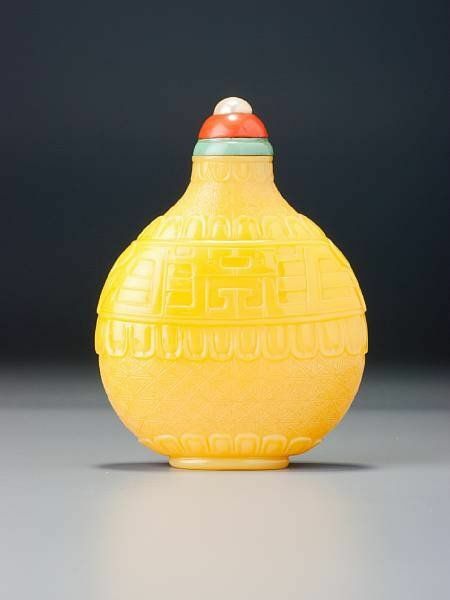 A remarkably similar bottle, formerly in the Edmund F. Dwyer Collection, bears an unquestionably genuine Qianlong reign mark in a style commensurate with the beginning of the reign (Christie's, London, 12 October 1987, lot 73 and Christie's, New York, 3 December 1992, lot 364) and another, from the Wise Collection (Stevens 1976, no. 186) also bears a genuine Qianlong reign mark, although this is not mentioned in the caption. Another example, lacking a reign mark, is in the Mullin Collection (ibid., no. 188 and Chinese Snuff Bottles No. 5, p. 25 fig. 8). 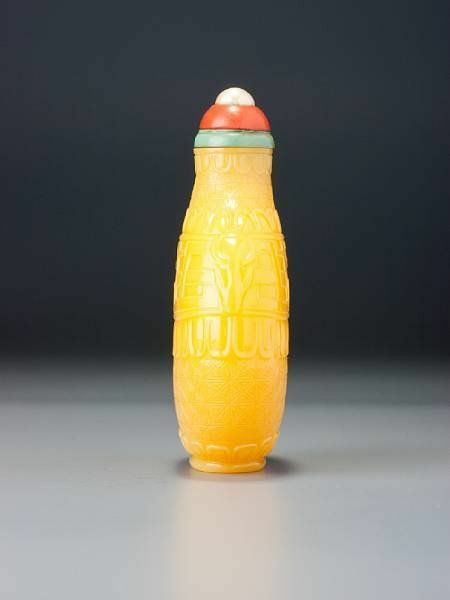 The Dwyer bottle exhibits similar handles, although with a squarer snout more closely resembling that of a buffalo. This beast also appears as part of the main decoration, where it is unambiguously bovine, raising the possibility that the antelopes here are self-conscious buffaloes illustrating the benefits of a little Californian surgery. 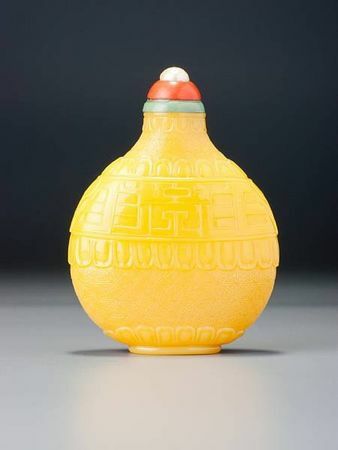 Our attribution to the imperial glassworks is based upon the imperial yellow colour and the impeccable level of carving. The style of this example is found in other materials, such as nephrite. One of the most spectacular of the group, this was a great favourite of Hugh Moss's during the many years when it resided comfortably in his private collection, being quite the most spectacular imperial yellow glass he owned. It is alarming, however, that in all the years of ownership, and all the years it has been in the Belfort Collection - which he knew well - not to mention the Bloch Collection, where he has played a curatorial role, he overlooked one blindingly obvious fact: the stopper appears to be the original one. It is thus one of the few bottles of a type always intended to have a contrasting stopper where we can be reasonably certain this is the case. 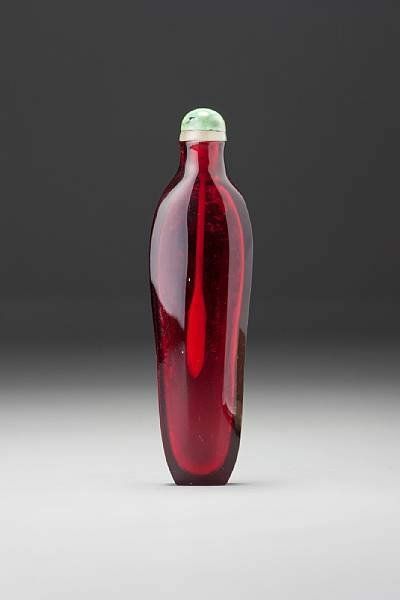 While we can never be absolutely sure of originality as opposed to suitability with regard to contrasting stoppers, we are confident that this was indeed originally designed for the bottle, for a number of reasons. It fits perfectly and looks splendid, fulfilling two timeless criteria for stoppers. It is obviously old, with well-patinated surfaces, particularly evident from the turquoise collar, whose slightly discolouration renders it an even green on the outside edge but a paler colour underneath, where it was protected from both light and the touch of the hand. The collar is not the customary flawed turquoise, with traces of the common brown matrix, but is of even, flawless colour, extremely rare for a turquoise collar, while the coral is similarly flawless and of brilliant colour. In addition, the coral cabochon itself is of deep, even, and flawless colour. 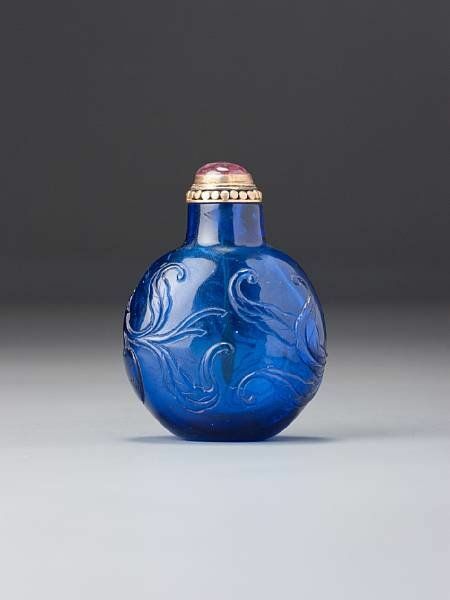 Were a transcendently fine snuff bottle to be made for the emperor, it would indubitably have been crowned using the finest materials available. Atop the coral we find not the usual discreet, small bead finial, but half of a fine pearl. This treasure was associated with the emperor and reserved for his court hat. Finally, the stopper still possesses what appears to be the original spoon, typical of the beautifully carved and imaginative spoons of the Qianlong palace workshops, produced, no doubt, in the imperial atelier. Its shaft is so elegant and thin that its survival is little short of miraculous. It is of ideal length, as defined by other examples where we may be equally sure that the spoon is the original.